Welcome to Marino Chrysler Jeep Dodge Ram! We’ve designed this website to serve as a powerful resource for drivers. Whether you’re looking for a brand-new car or professional service for the one you’re driving now, we can help. Buying a new car can be a fun and exciting experience, and there’s no place easier to shop at than Marino CJDR. We carry a large inventory of new cars for you to choose from, so you can be sure you’re not being limited by a small selection. Whether you want a sporty coupe or a versatile SUV, we have all body styles available for you to explore. To get started, navigate to our new inventory page. There, you’ll be able to shop our entire selection of vehicles. Browse by year, make, model, and more to refine your search and see only the vehicles that matter to you. We have one of the best inventories of new cars in Chicago, IL. Just like our inventory of new vehicles, you can shop our collection of used and pre-owned models online. When you see a vehicle you like, click on it to discover more details about the vehicle like additional options and photos. Then, estimate your monthly payments or schedule a test drive to learn more about the car. In addition to our used car inventory, we also carry a variety of certified pre-owned vehicles. These models provide exceptional value because they’ve undergone a rigorous multi-point inspection and come backed by a manufacturer warranty. From a simple oil change to a major engine repair, the technicians at Marino CJDR can take on whatever service or repairs your vehicle needs. With years of industry experience and hands-on training, we’ll not only fix your car correctly the first time, we’ll do it quickly so you can get back behind the wheel. In addition to world-class service, there’s a variety of benefits with choosing the Marino CJDR service center for all your routine maintenance or emergency vehicle repairs. That includes a free shuttle service, early bird drop-off, free Wi-Fi, and the use of genuine Mopar parts when repairing your vehicle. Buying a car just got much easier thanks to the finance department at Marino CJDR. Our financial specialists will work with banks and local lenders to find you the best terms available. No matter what state your credit score is in, our team can help you get the credit you deserve. We’ll even make sure you get the most value for your trade-in to put toward the purchase of your next vehicle. 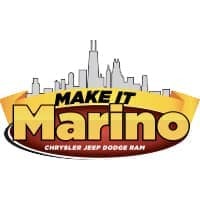 Take a few minutes to explore our website, and if you have any questions, don’t hesitate to contact us at Marino CJDR—serving drivers in Chicago, Skokie, Park Ridge, Forest Park, and beyond.